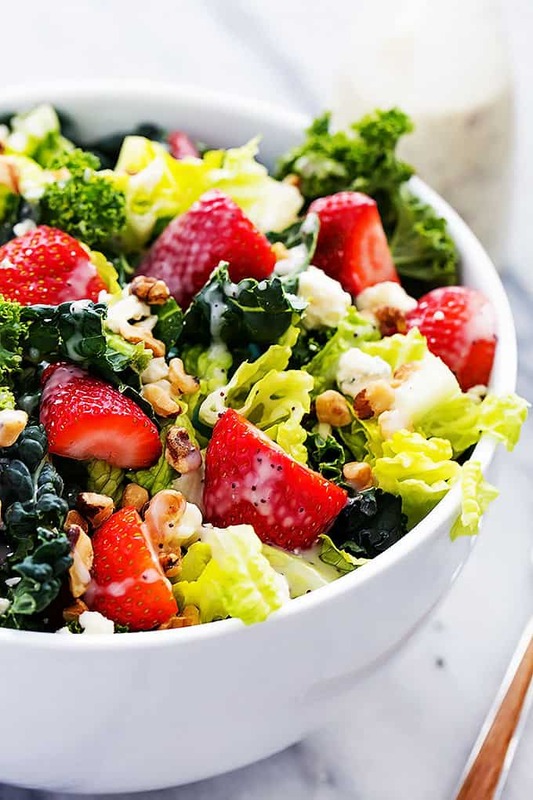 Crunchy, fresh kale salad tossed with juicy strawberries, walnuts, blue cheese crumbles and homemade creamy poppyseed dressing all put together in this delicious Strawberry Poppyseed & Chopped Kale Salad. Salads are my go-to. “Lettuce” of various kinds holds a permanent place on my weekly shopping list because I can’t go a week without it. I love to eat salads, but just as much as I love to eat them… I love to make them. Because they are so darn easy. 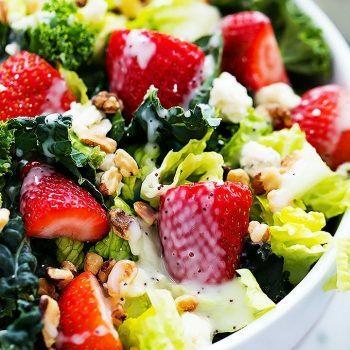 Another thing that needs to go on that list is the fact that salads are easy to swing as a main dish or a side dish, depending on what you need/want. Almost every single night I throw together a salad to go alongside our dinner and when I want to turn that salad into a main dish, I just add some grilled or baked chicken and voila – instant entree. This salad is my latest love. You may have noticed that kale is all the rage these days because it has so many health benefits. I threw some into a salad this week and loved how it turned out! 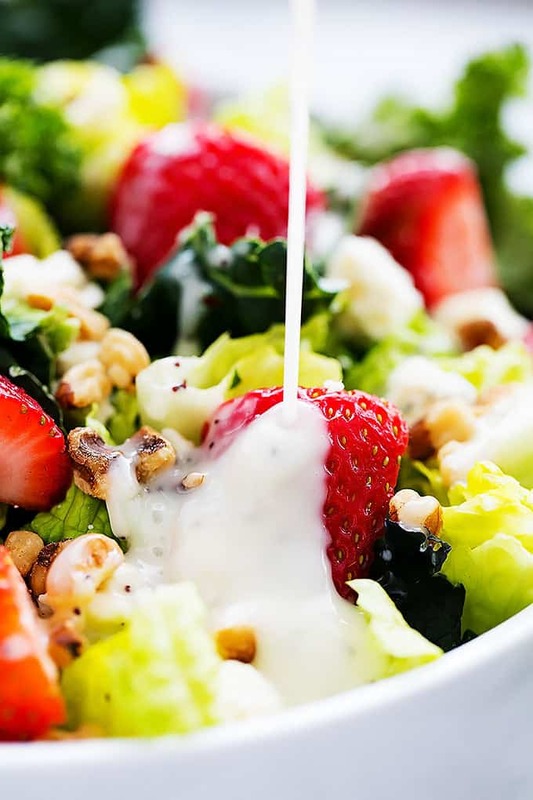 Just add strawberries, blue cheese crumbled, walnuts, and my FAV easy homemade creamy poppyseed dressing (with a greek yogurt swap if you want!). It’s crazy-easy to make and so so yummy! The perfect addition to any dish on your menu this week or even a main dish if you wanna turn this pretty salad into your entree! 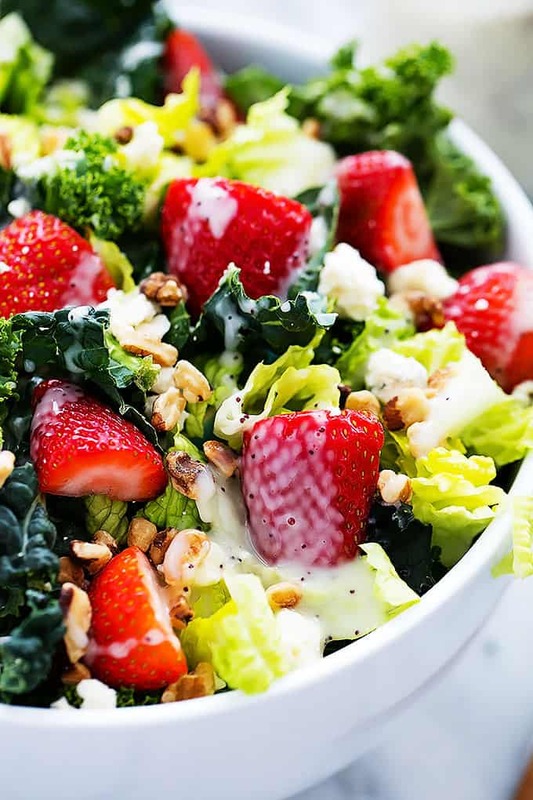 Crunchy, fresh kale salad tossed with juicy strawberries, walnuts, blue cheese crumbles and homemade creamy poppyseed dressing! First prepare the dressing by blending all salad ingredients together (except for poppy seeds) until smooth. Stir in poppy seeds. Cover and chill until ready to use. 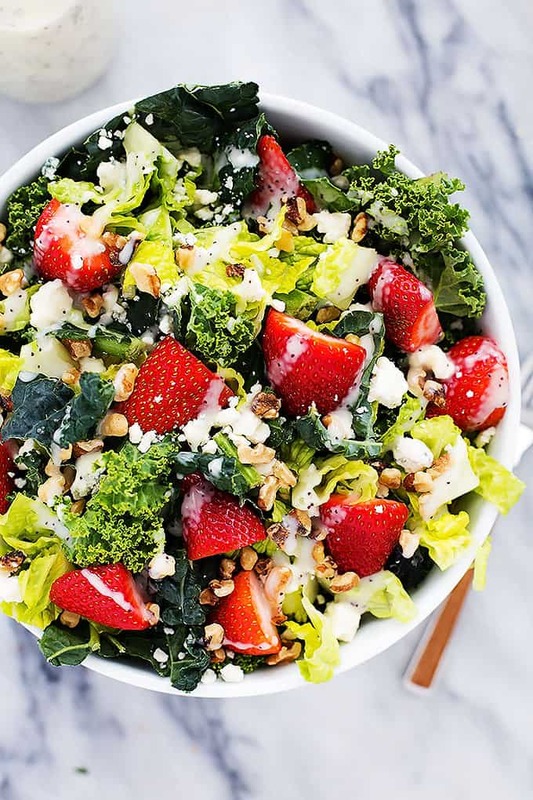 In a large bowl toss together kale, romaine (if using), and strawberries. Add poppyseed dressing and toss to coat. Top with nuts and blue cheese crumbles. Serve immediately (see notes). Adding romaine lettuce is completely optional here. When I made salads with dark greens I love to throw in a handful of a brighter lettuce if I have some in the fridge. 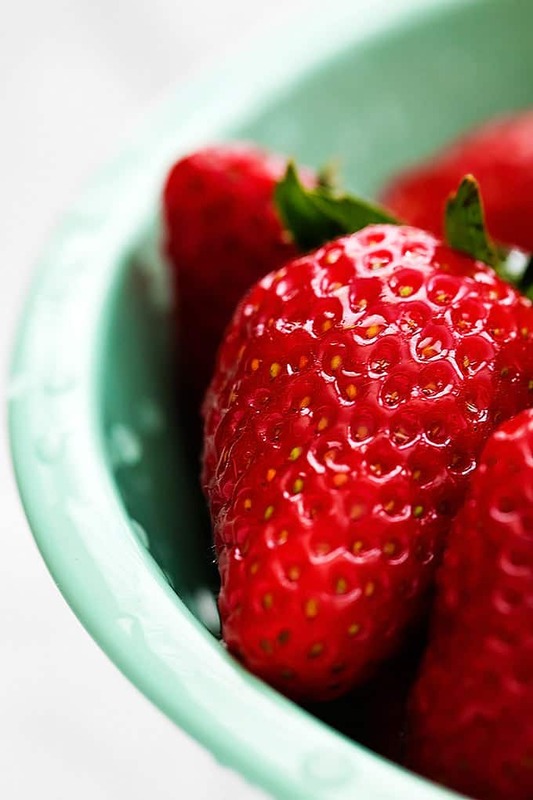 It's mostly for color, and sometimes for texture (such as when paired with spring greens or baby spinach). If you have some on hand, add it! If not don't worry about it! 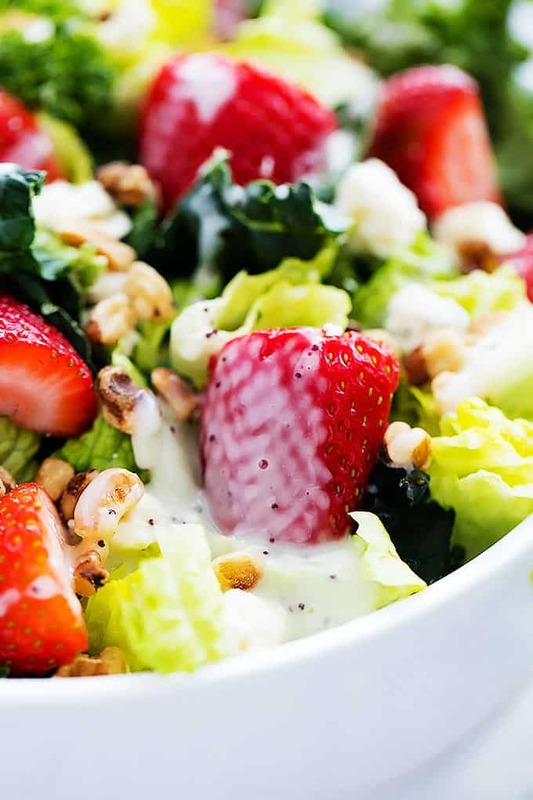 If you are preparing this salad ahead of time I recommend tossing the salad without the dressing, then add the dressing and toss immediately before serving OR you can serve the dressing on the side. For the dressing, you can sub part or all of the mayo out for plain fat greek yogurt. This will change the taste a bit but will make a lighter/healthier dressing.